USDCHF is massively under the influence of Switzerland’s industrial production. This pair has been moving with bullish bias climbing the ascendant channel. Now the support lies at 0.98790 with resistance at 0.99190 which both lines are above the weekly pivot point at 0.98580. The price is above the Ichimoku Cloud and the Chinkou Span. The Tenkan-sen is showing a downward movement while the Kijun-sen is showing a horizontal movement. The MACD indicator and the RSI are in neutral zone but the Stochastic is showing upward trend. The EMA of 10 is above the EMA of 75 and it seems that there is strong resistance at 0.99 area. Pullbacks can happen at any time soon. 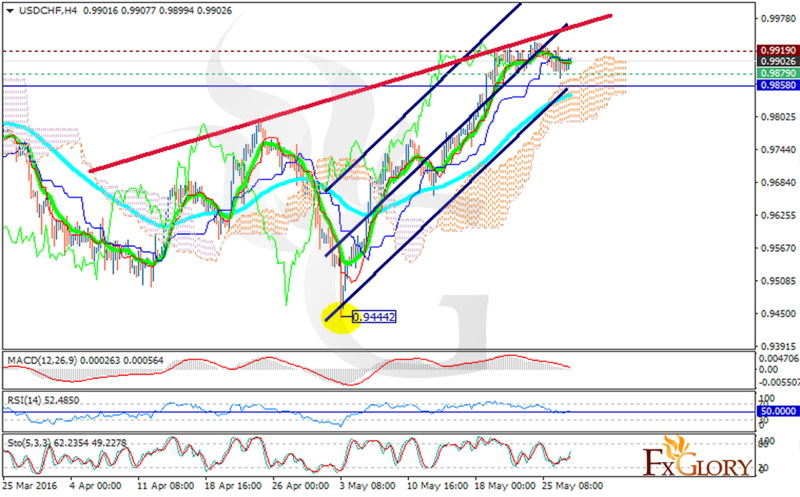 The support level breakthrough will pave the way for further decline targeting 0.9860.